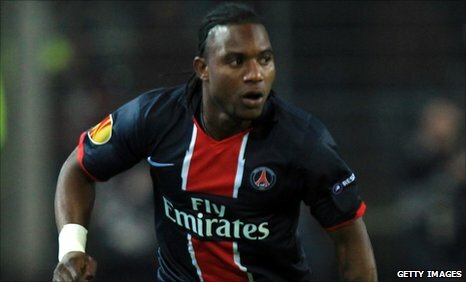 Sunderland have signed Benin midfielder Stephane Sessegnon from French club Paris St Germain. The Black Cats paid £6m for the 26-year-old international, who has signed a three-and-a-half-year deal. "The transfer has been long and the execution tough but I am very happy," Sessegnon told the club website. "I want to thank chairman Niall Quinn, manager Steve Bruce and assistant boss Eric Black for all the support they've shown me." Sessegnon began his career playing club football in Benin before moving to French second division side Creteil. He then moved to Le Mans before PSG signed the midfielder in 2008, making a total of 76 appearances. Sessegnon, who has 36 international caps, scored eight goals at the Paris club. His arrival is Bruce's second major signing of the January transfer window, having also acquired the services of Sulley Muntari on loan until the end of the season. "Stephane can play on the left, on the right, through the middle - he's lightning quick and he's a match-winner," added Bruce. "He's a little powerhouse with a small centre of gravity, some great dribbling skills and a good shot. "I think he'll be a big hit with the supporters. I predict he'll turn into a crowd favourite. "His ability to slot in across attacking positions makes him a great addition to what is a young and hungry squad."